My name is Larry Griggs, owner and operator of the kennels. I have been breeding and training dogs for over fifty years. I am now retired from public work and now spend all my time with the dogs. I have been breeding in hopes of producing dogs that had enough dominance to work rodeo bulls and cow calf pairs. I have used the influence of several lines of dogs to come up with a dog that will do what I set out to accomplish. This has been a very long and expensive challenge. At best it is no guarantee that all your breeding will be as you hoped they would. I have tried every breed that is suppose to work cattle. I have tried crossing breeds and have come up with some good dogs once or twice, but not any that would breed true. 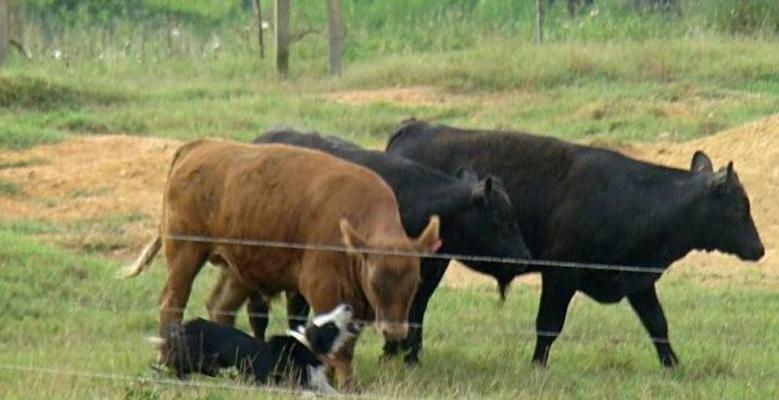 I finally settled on Border Collies, but it took a long time to come up with the type dog to work rough stock on a daily basis. I work pairs and my associate works rodeo bulls.